"And those who fell in the World War 1939-45"
David, the name by which he was known, was born in 1912 and died 19th December 1944 aged 32. He served in the Royal Navy and was at the time of his death a chief motor mechanic. He was based at Gosport and served in motor torpedo boats in the English Channel and North Sea. He drowned in the Hamble River at Lower Swanwick when the dinghy into which he was stepping accidentally overturned, there was no Post Mortem. This information has been obtained from a copy of his death certificate. It is believed he was buried in Gosport Cemetery. His parents were Joseph and Lucy (née Hollingshead) and he was one of six children (one died in infancy). His mother had been in service at Shawell Rectory in Leicestershire and later at Woodborough Hall, she met Joseph whilst working at Shawell. They came to Woodborough looking for work and lived at Thorneywood Cottage, where Joseph was a market gardener. David was a member of the Woodborough United Brass Band. Information from a family member (David’s half-sister) and a certified copy of his death certificate has been seen to verify the place and date of death. Born 1914, died 6th July 1941 aged 27. Of Nags Head Public House, Main Street, Woodborough. 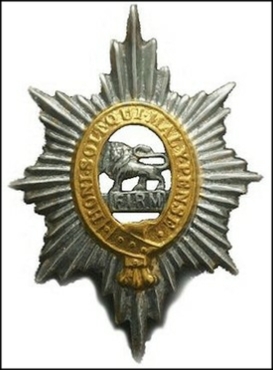 5117806 Private 1st Battalion, Worcestershire Regiment. He was the son of Robert and Rebecca Greaves and as a child lived at the Nags Head. He married Kathleen Pykett and had one son, Colin, and lived at the Old School House at Gunthorpe. Before joining the army he worked at the Calverton Hosiery Factory in Calverton.He is buried at Khartoum War Cemetery, reference 2D 20.J. acknowledged to the Commonwealth War Graves Commission. Born 15th May 1910 died 25th September 1943 aged 33. Of New Row, Woodborough, Nottingham. 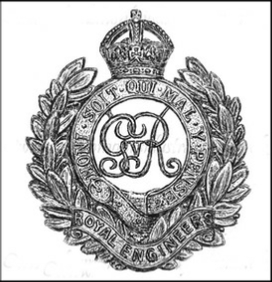 2124359 Sergeant 268 Field Company Royal Engineers. Sgt Hallam, Royal Engineers, was building Bailey bridges at Burnham Beeches in Buckinghamshire. A Bren carrier crossing the river was not properly secured, it rolled back and he was knocked unconscious and drowned. He is buried in Carlton Cemetery (Gedling, Nottinghamshire) . Reginald’s parents, Robert and Edith Hallam moved to Roe Lane Cottage c1917 which is at the rear of the Institute where his mother ran the shop at the front and his father, who was a blacksmith, at the rear of the same premises. Reginald was the eldest of four children he was married to Annie and lived in Westdale Lane, Carlton with their two children. Reginald as a corporal at the time this photograph was taken. Information provided by his sister and his daughter. Born 20th September 1918, died 21st June 1942, aged 23. 1480184 Lance Bombardier of 277 Battery (City of Nottingham) 68 Heavy Anti-Aircraft Regiment, Royal Artillery. Peter was killed in action at Tobruk. 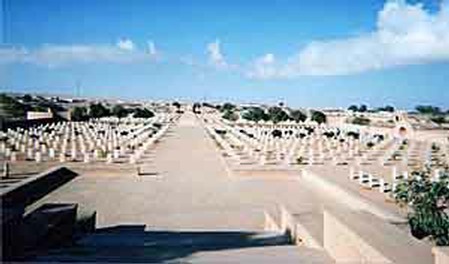 Buried at Knightsbridge War Cemetery, Acroma, Libya. Eric Chadwick recalls the events leading up to Pete’s death on 21st June 1942. “After weeks of aerial bombardment by screaming Stuka dive bombers, Rommel’s army had broken through the defences around the crucial port of Tobruk. British forces had been fighting throughout the afternoon notching up several tank ‘kills’ but their luck was about to run out. Eric had seen several Nottingham pals, including Pete, killed by enemy fire”. Eric was captured and sent to a POW camp. Unfortunately this poor quality photograph of Lance Bombardier Paulson is the best that could be obtained. The defence against Rommel's drive across Cyrenaica towards Suez consisted of a number of irregularly spaced strong points or 'boxes' linked by deep minefields. Those nearest the Axis forces were held by infantry, while those further back served as reserve static positions and as bases from which the armour could operate. The chief 'box', known as Knightsbridge, was round a junction of tracks about 20 kilometres west of Tobruk and 16 kilometres south of Acroma, commanding all the tracks by which supplies came up to the front. The Eighth Army's advance fuelling stations and airfields were at Acroma, El Adem, El Duda, Sidi Rezegh and Gambut, while by February 1941, Gazala aerodrome, taken from the Italians early in the campaign, housed two Commonwealth squadrons. Knightsbridge was thus a key position, and the pivot on which the armour manoeuvred during the heavy fighting which commenced in late May 1942. Fierce actions were fought at all these places, and a battlefield cemetery was created at each for the burial of the dead. The graves of many of those who gave their lives during the campaign in Libya were later gathered into Knightsbridge War Cemetery from the battlefield burial grounds and from scattered desert sites. The men who fought and died with them, but have no known grave, are commemorated on The Alamein Memorial which stands in El Alamein War Cemetery, Egypt. There are now 3,651 Commonwealth servicemen of the Second World War buried or commemorated in Knightsbridge War Cemetery. 993 of the burials are unidentified and special memorials commemorate a number of casualties known or believed to be buried among them. Born 30th October 1921, died 16th May 1940. Aged 19. 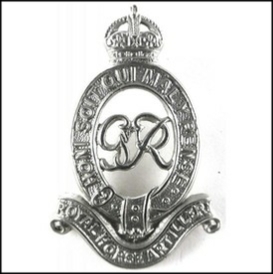 912360 Gunner 107 (South Notts Hussars) Regiment. 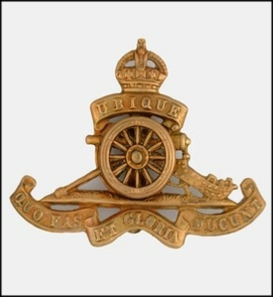 Royal Horse Artillery. Died on active service at British Military Hospital, Jerusalem. Buried at Ramleh (Ramla) War Cemetery, Israel. The cemetery at Ramleh dates from the First World War, when Ramleh (now Ramla) was occupied by the 1st Australian Light Horse Brigade on 1st November 1917. Field ambulances, and later casualty clearing stations, were posted at Ramleh and Lydda from December 1917 onwards. The cemetery was begun by the medical units, but some graves were brought in later from the battlefields and from Latron, Sarona and Wilhema Military and Indian Cemeteries. elsewhere in Israel where their graves could no longer be maintained. Only 74 of the casualties are named. The Ramleh 1939-45 memorial, commemorating 28 Jewish and non-Arab servicemen of the Second World War, and six non-war casualties of the Palestine Police Force, who lie buried in the cemeteries elsewhere in Israel where their graves could not be maintained in perpetuity. Epic of South Notts Hussars who fought to the end and were overrun by Nazi tanks. (From an unspecified newspaper cutting). A great tribute to the work of the South Notts Hussars in the Libyan campaign is contained in a letter which has just been received from the Middle East. The writer says: “The Regiment has been simply wonderful. Everybody says so. The RSM was not with the Regiment but had a job taking guns up to the desert from the base, and on his last trip he found ten men from the SNH who had escaped and they told him they had seen Billy (Col. Seely) and Peter Birkin being captured, both unwounded. They were overrun by 500 German tanks, they and another gunner regiment, and knocked out 350 before they were captured, the last few at 20 yards. “Every single person says that the Germans are very good to their prisoners, especially if they have fought well; that they admire that more than anything. Surrounded by tanks: It is difficult to write about it, but I suppose such things have happened before. Bob Daniel (the regular second-in-command, who managed to escape, said he had never seen a finer show. He said that it was epic, and they were all absolutely wonderful. “They were completed surrounded by enemy tanks, and the battle went on from 5 a.m. to 6.30 p.m. By 6.15 p.m. they had run out of ammunition and our tanks could not get through to bring up any more, and as gun by gun became useless, and was overrun, the men for the last quarter of an hour threw hand grenades and firebombs at the tanks until they were either killed or captured. “It is a very sad day for Nottingham. But I do pray that there are really quite a lot ‘in the bag’. The general said how magnificently they had done. I think Notts will be cheered up a bit to know how really splendid the South Notts Hussars have been”. The following is an excerpt from ‘Once a Hussar’ by Raymond Knight-Ellis, serving with the south Notts Hussars in World War Two. “The time passed all too quickly, and towards the end of April we had two full regimental schemes before moving to Bir Asluj for the purpose of training with live ammunition; obviously when artillery regiments wished to fire live shells they have to find some remote uninhabited spot to fire live shells in safety. Bir Asluj was not only remote and uninhabited it was decidedly unpleasant. Situated in the Sinai Desert, 80 miles beyond Gaza, it was the most God-forsaken spot imaginable. The only thing that made it habitable was a well which provided necessary water. The sand in this baked, arid wilderness is a kind of alkaline dust, very, very fine, like powder, so that the merest breath of wind produced a dust storm of these suffocating particles. The temperature maintained a constant 95 degrees Fahrenheit (34° centigrade) in the shade throughout the daylight hours, and fell to freezing point during the night. The foregoing will give you an idea of the harsh conditions – Alec Bridgett. “In this awful place my very dear friend Bob Paulson was taken ill. He had violent pains in his abdomen and he lay in a little bivouac tent unattended for most of the time. The medical orderly Harry Day tried to persuade the medical officer that Bob was suffering from appendicitis but the doctor would have none of it, he said it was merely a stomach upset. Harry pleaded for Bob to be sent to hospital, but it was all to no avail. Our doctor was a conceited man with a notable indifference to the well-being of the troops in his care. In this case, he was incompetent and failed to diagnose what was obviously evident to his orderly. Poor Bob, he lay in ever increasing agony, and he tossed and turned on his blanket in a dirty sweaty little tent until at last the doctor realised his mistake and ordered him to be removed to hospital. Alas! It was too late, the hospital was 250 miles away, and Bob had a burst appendix. He died in Jerusalem Hospital on 16th May 1940 and he was only 19 years of age. When the news reached us that Bob had died, the bottom seemed to drop out of my life. I could not believe that anybody so young and full of life could be so suddenly snatched away. It made me feel so vulnerable and far from home and the sadness of losing my dear old friend was too much for me to bear. I was sobbing like a child sitting on my blanket when the Sergeant Major came into my tent and found me. He was a kindly man old enough to be my father and he had served in the First World War. He put his arms across my shoulder and said, “You're going to shed a great many more tears before this lot is over, my lad”. I was chosen to be one of the funeral party which set off for Jerusalem the following day. There was no proper road across the desert from Bir Asluj, just a bumpy track. We were by now accustomed to riding over bumpy ground in bouncing trucks, but during this journey I was thrown in the air and hit my head on the steel canvas support, my head was cut and my nose started to bleed and it became a nightmare journey as I was covered in dust and blood and had no way to clean myself. This was bad enough, but it must have been worse for Bob Paulson making the same journey with a perforated appendix. The Sister at Jerusalem Hospital told us she had never known anyone fight so hard for their life as Bob had done. Had he been admitted to hospital at an earlier stage, his life could have been easily saved. We laid Bob to rest in Ramleh Cemetery and sounded the Last Post and the Reveille, and we fired a farewell salute over his grave before sadly turning away, never to return to that unhappy place, but it has remained in my memory all my life, a symbol of all the heartache, the waste and the futility of war. Bob’s name is carved on the memorial in the churchyard in the village of Woodborough where he lived. Far better if I sit typing these that his grandchildren were filling the churchyard with laughter. This gives some indication of the love and respect that Bob Paulson engendered in his friend Raymond Ellis and others of the South Notts Hussars. Born 1919, died 2nd May 1945 aged 26. Of 1 Private Road, Woodborough, Nottingham. Son of Joseph and Florence Richardson; husband of Hilda Annie Richardson, of Arnold, Nottinghamshire. 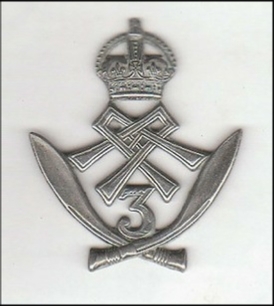 3689 Major 1st Battalion 3rd (Queen Alexandra’s Own) Gurkha Rifles. He joined Army in 1939 and served in the Sherwood Foresters. He later obtained a commission as Lieutenant and was posted to 38 Gurkha rifles in India. 29th October 1944. Lt Richardson arrived from 38 GR and was assigned to ‘C’ Company. Time was spent training and exercising with the troops and practising jungle patrolling. 13th January 1945. 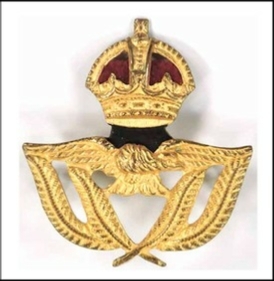 Promoted to Captain and appointed commanding officer of ‘A’ Company. The following day, the battalion moved into Burma on operational service. 18th January 1945. The battalion crossed the Bramaputra River into Japanese held territory. N.B. Pages from the diary for February 1945 are missing. 4th March 1945. The battalion arrived at Meiktila, a jungle airfield, which they were tasked to defend. The companies patrolled the local area, made contact with local villagers, and received intelligence from them, and had several skirmishes with Japanese forces. 11th March 1945. The airfield was attacked by several hundred Japanese supported by tanks. Heavy fighting ensued, the Japanese being driven off after an air strike by Mosquitoes and Thunderbolts. 18th March 1945. Promoted Major ‘A’ Company, moved south into hilly area to set up an observation post. N.B. Pages from the diary are missing. 18th April 1945. Battalion moved along road to clear Japanese, now in retreat but still resisting. Many troop movements and contacts and firefights. ‘A’ Company shot up a staff car and captured two swords. Reinforcements being brought in by both sides. 27th April 1945. Battalion halted and ordered to move back and clear village just passed, as it had just been re-taken by the Japanese. Awaiting arrival of tank support, ‘A’ Company sent back to the road to harass the Japanese traffic. 28th April 1945. Battalion moved up behind the tanks, ‘C’ Company in advance, ‘B’ Company to their right, ‘A’ Company followed ‘C’ Company and ‘D’ company followed ‘B’ Company. They were met by heavy resistance. ‘A’ Company was ordered back to the road to rendezvous with armoured cars to ambush escaping Japanese traffic during the night of 28/29th April. During the ambush of a Japanese staff car, escorted by Jeep just after dark, Major Richardson was seriously wounded and was later removed to Battalion Hospital. Major Richardson died of his injuries on 2nd May 1945. 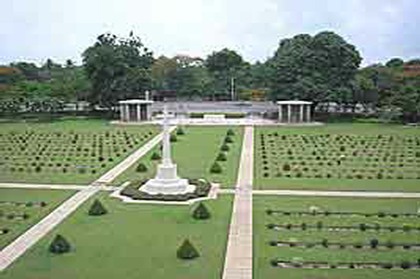 He is buried in Taukkyan War Cemetery, Rangoon, Burma. Two views of the Taukkyan War Cemetery, Burma. Wilfred Richardson known as “Crack”. Born August 1921, died 10th April 1944 aged 23. Of Thorpe’s Cottage, Main Street, Woodborough (opposite Nag’s Head, Shelt Hill side). 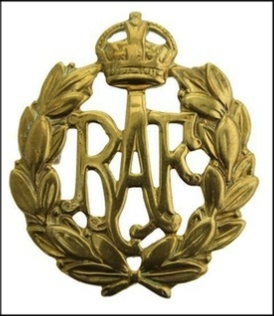 745445 Warrant Officer (W/O) RAF. Pilot/Instructor. Attended Bemrose Methodist School, Derby. Also Derby Technical College. Apprenticed to Rolls Royce (Engines) Hucknall. 1943 – Returned to UK for training for operations high altitude photo reconnaissance in Mosquito Aircraft. Killed in training crash 10th April 1944 it is believed that both engines cut out on takeoff and crashed into a stone wall. He is buried in Woodborough cemetery. Below Wilf's record of service & right his flights. copyright is acknowledged to military-aircraft.org.uk. This photograph of a DH Mosquito which, if not identical to the one that crashed, would be similar. Arthur was born on 29th January 1921 at Brook Cottage, Woodborough (on Main Street next to Mr Alvey’s cobblers shop) and was known for most of his life as ‘Nip'. The family, his mother and father Neville and Annie moved to Joe’s Cottage on Foxwood Lane in 1924 and a final move in 1931 to 48 Main Street. He left Woodborough Woods School in 1932 or 1933 and went to Newark Magnus Grammar School, on a scholarship until 1937. On leaving school, he went to work for Harry Parnell who was his uncle, and a Building Contractor, as a trainee surveyor. He worked there until he joined the RAF in 1942 at the age of 21. After being rejected for pilot training on medical grounds (unknown) he trained at Compton Bassett as a wireless operator, and on completion of that course he again applied for aircrew training and was accepted. June 21/22 1944 Failed to return from raid on Wesseling, Germany. Hit by flak and crashed into Rhine near Duisburg. Buried at Reichwald Forest, War Cemetery. Toulouse, France. 8 hours 10 minutes, night. Mailly-le-camp, France. 5 hours 50 minutes, night. Salbris, France. 5 hours 30 minutes, night. Gennevilliers, France. 4 hours 15 minutes, night. Bourg-leopold, Belgium. 3 hours 50 minutes, night. Caen, France (ordered not to bomb). Six aircraft failed to return from this raid from 619 Squadron, also 44 and 49 Squadrons lost six aircraft. In all, 37 Lancasters failed to return, representing 27.8% losses. The aircraft was a Lancaster Mk 3 – ‘S’ ND986, time up 23.24. The whole crew are buried at the Reichwald Military Cemetery, Germany, their bodies apparently having been recovered from the River Rhine. 619 Squadron Lancaster III ND 986 PG-S took off 2324 hours on 21st June 1944 from Dunholme Lodge – P/O Kent Elliot Crawford RAAF. The target was a synthetic oil plant at Wesseling located on the Rhine, about 10 miles south of Cologne. PG-S hit by flak and fell into the Rhine between a road bridge and a rail bridge at Duisburg. All 7 bodies of the crew were recovered and interred at Dusseldorf in the Nordfriedhof. The bodies of the crew were later removed to the Reichswald Forest War Cemetery. 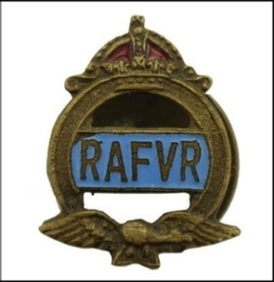 Although by no means unique, it was unusual to have three Commonwealth and Dominion air forces represented in one crew. type III, of 619 Squadron. Right: A typical wireless-operators station in a Lancaster, this photograph is taken from inside a museum aircraft. 619 Squadron and the Wesseling Raid 21/22 June 1944: In June 1944 No. 619 Squadron based at Dunholme Lodge, as was No. 44 Squadron. 619 (5 group) was formed at Woodhall Spa in April 1943 until January 1944 then they moved to Coningsby and remained there until April 15th, then on April 17th 1944 they moved again to Dunholme Lodge. It them moved to Strubby until June 1945, then to Skellingthorpe and was disbanded in July. Steve Rew’s revised history of the No. 619 Squadron (1988) says this Wesseling raid: “the shortest night of the year was the squadron’s worst night ever, and indeed a bad night for No. 5 Group generally. Sixteen aircraft from 619 were among those which set off to attack a synthetic oil plant at Wesseling, a small town on the Rhine about 10 miles south of Cologne. P/O Morcom in “A” was forced to return early with a failure of the directional finding compass, and no less than six of the squadron’s aircraft failed to return. They were ‘D’ flown by P/O Johnson, ‘G’ flown by P/O Davis, ‘H’ flown by F/L Saunders, ‘S’ flown by P/O Crawford, ‘V’ flown by F/Sergeant Buckley, and ‘W’ flown by P/O Baker. No. 44 Squadron also lost six aircraft, as did No. 49 Squadron at Fiskerton Lincolnshire, while the three or four squadrons at East Kirkby base lost seventeen aircraft between them. F/Sergeant Buckley was flying ‘V’ on her 71st trip, far more than any other aircraft in the Squadron. The reason for these heavy losses was a combination of factors. The aircraft were bombing above cloud, against which the aircraft were silhouetted by brilliant moonlight, and were thus easily visible to the exceptional concentration of night fighters which gathered to defend this vital target. Nevertheless, despite their efforts, and very intense flak, the target was very severely damaged”. Target Map: This was copied from an original in the possession of the late Dennis Dear, Bomb Aimer in EM-G LM125 of 207 Squadron who flew on this raid. “Unfortunately my target map is virginal! On some of my other target maps there were pencilled notes re target indicator colours etc. but this night must have been simple and did not justify notes. Target maps were pretty useless anyway and only contributed in that they could be used to familiarize oneself with main features before take-off. In this example one could only have hoped to see the bend in the river given a clear night!”. White circles have been placed over the numbers, the original circles are very difficult to see in the photo below, but numbers 1, 2, 3, 4 etc. are one mile apart and just discernable. “133 Lancasters and 6 Mosquitos to attack the synthetic oil plant at Wesseling: all the aircraft in this force were from 5 Group except for five Lancasters provided by 1 Group. The weather forecast for the target area (and for the attack on Scholven/Buer which took place at the same time) predicted clear conditions but the bombing force encountered 10/10ths low cloud. The planned 5 Group low-level marking method could not be used and the reserve method, in which the Lancasters bombed on H2S, was used instead. German night-fighters made contact with the bomber force and 37 Lancasters were lost – 44, 49 and 619 Squadrons each losing 6 aircraft. The casualty rate represented 27.8% of the Lancaster force”. 83 Squadron’s Pathfinder Lancasters were at the front and lost (only) two out of ten. No WINDOW [anti radar metal foil strips] was dropped and ABC Lancasters [radio countermeasure aircraft] were not flying that night. It can only be conjectured that the raid planners were not anticipating much reaction by the enemy night fighters. Clearly, Bomber Command had momentarily lost initiative in the countermeasure battle”. (The Avro Lancaster, Francis K. Mason, P190-191). In fact 101 Squadron did have at least one ABC aircraft on the raid and eye witness accounts from more than one squadron and including Sergeant F.R. Haslam’s aircraft refer to the use of WINDOW. Haslam’s analysis of the raid based on looking at take-off times within squadron, to see if there was any ‘clumping’ of losses shows that 28 of the 37 WESSELING losses look as if they could have been close in the stream – about two thirds of all the aircraft lost. It certainly looked as if it was unhealthy to be around trouble. “The target was expected to be clear but was covered in 10/10 cloud. Route in and out heavily attacked by fighters from and beyond the enemy coast. Target flak predicted and accurate. The Controller decided it would have to be a blind attack owing to 10/10ths low cloud so called in the two deputy blind markers at 01.32 hours. Only one replied. Did two runs releasing own TI’s on the second one. Called the Controller on the release, could not get a reply, subsequent non-reply to VWF calls and no W/T transmission from Controller made me assume he was out of action so I took over control at 01.39 hours”. According to Bomber Command War Diaries “post-raid reconnaissance showed that only slight damage was caused to the oil plant and this is borne out by a local German report which adds that 15 Germans, 5 foreign workers and 1 prisoner of war died in the nearby town of Wesseling. But a secret German report quoted in the British Official History (Vol. IV; p 323) records a 40% production loss at Wesseling after this raid. It is possible that the loss was only of short duration”. Bomber Command War Diaries also record that Wesseling was attacked again by 194 aircraft of 1, 6 and 8 Groups on 18/19 July 1944, with the loss of just one Halifax. This was a very successful raid and a credit to Pathfinder marking. Approximately 1000 high explosive bombs fell inside the area of the plant, in twenty minutes. 20% of the installations were destroyed but, because some important buildings were particularly hard hit, the loss of production was greater than this figure. In the raid on Scholven/Buer plants the same night, of the 550 bombs which fell in the plant area, 233 failed to explode! 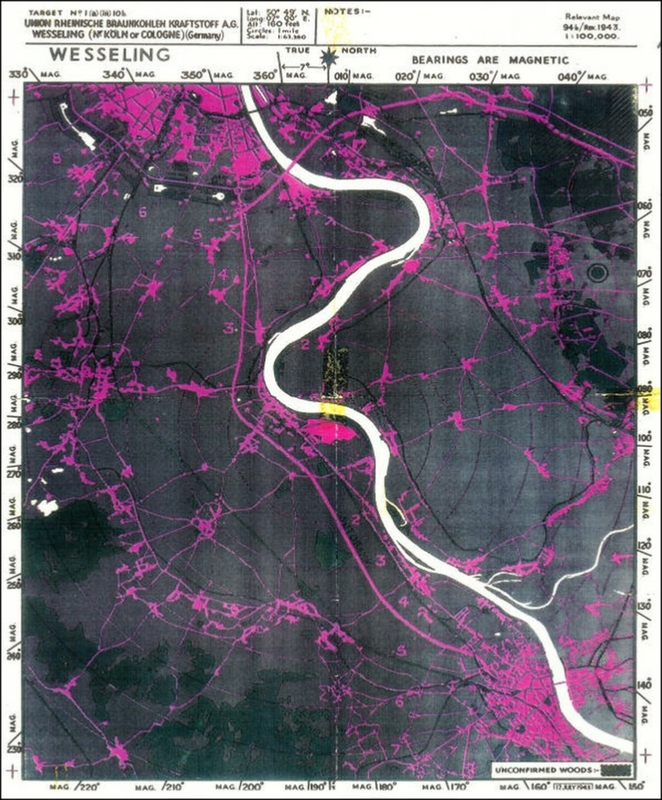 Mosquitos continued to raid Scholven/Buer for several nights, indicating the importance of these oil targets. We have looked at the map. The information gives us the point where Arthur Ward died: “hit by flak and fell into the Rhine between a road bridge and a rail bridge at Duisburg”. We think, he died in the River Rhine at the point marked by the arrow. The site of the crash at Duisburg and the target area of Wessling are about 70Km (45 miles) apart. Duisburg is situated on the Rhine north of Wesseling which is also on the Rhine. Above: The River Rhine near Duisburg where it is believed Arthur's aircraft crashed. Our grateful thanks to all who have researched, provided information and illustrations, to make this piece about the men from Woodborough who died during World War II a truly worthwhile tribute to their sacrifice. Axis Forces in North Africa, July 1941. New Zealand 2nd Division. Major-General B. Freyberg. VC. 7th Armoured Division. Major-General W.
Ramleh War Cemetery left, the cemetery also contains a 'Stone of Remembrance', designed by Sir Edwin Lutyens and bearing words from Ecclesiasticus: "Their name liveth for evermore". Mr George Whitehead. We thank him for his work.